An American professional ice hockey player Connor Hellebuyck plays the position as goaltender for the Winnipeg Jets of the National Hockey League (NHL). In the 2012 NHL Entry Draft, Hellebuyck was drafted by Jets in the fifth round as it's 130th overall picks. Hellebuyck is currently dating his girlfriend Andrea Fanciullo. As of 2019, Hellebuyck has an estimated net worth over $8 million and earns an average annual salary of $7 million. Connor Hellebuyck earns a tremendous amount of money from his career as an ice hockey player. As of 2019, the estimated net worth of Hellebuyck is over $8 million. He currently plays for the Winnipeg Jets of the National Hockey League (NHL). On 12th July 2018, Hellebuyck signed a six-year contract with Jets for $37 million which included an average annual value of $6.167 million and the base salary of $7 million. Moreover, back on 24th July 2017, Hellebuyck had signed a one-year contract with Jets for $2.25 million. Similarly, Hellebuyck further earned money from his college ice hockey career. Hellebuyck also adds money from his international career with the United States National team. Connor Hellebuyck is much more secretive regarding his personal life. Even being such a well-known ice hockey player, he often keeps his personal details under the shade. 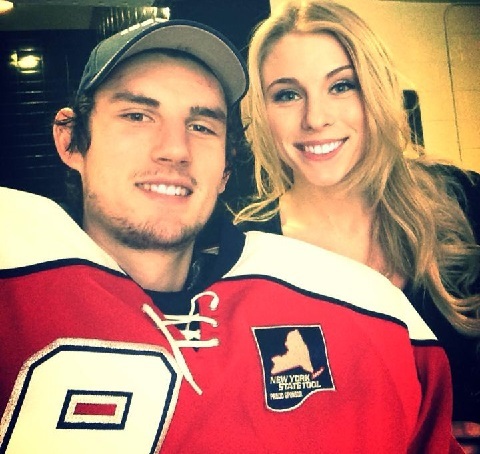 However, Hellebuyck is not married yet but he is currently dating his girlfriend Andrea Fanciullo. His girlfriend Fancicullo is the daughter of Joseph Fanciullo and Diane Eatherton. She is a former UMass Lowell sprinter and long jumper. Moreover, Hellebuyck was also a member of the Cross Country/ Track and Field team at UMass Lowell, where she participated in the long jump events. As the pair are dating, they haven't mentioned when they actually began dating. Similarly, Hellebuyck hasn't shared any photos of his girlfriend on his social accounts like Instagram and Twitter. Although they are dating, neither Hellebuyck nor Fanciullo has mentioned any plans of getting engaged or married. Connor Hellebuyck, aged 25, stands 191 cm which is 6 feet 3 inches tall in height and weighs around 95kg i.e. 210 lbs. Connor Hellebuyck was born on 19th May 1993, in Commerce Township, Michigan, United States. He was born to father Chuck Hellebuyck and mother Erin Hellebuyck. He grew up along with his brother Christopher Hellebuyck. Hellebuyck's nationality is American nationality and the famous goaltender belongs to the Caucasian-white ethnic group. His star sign is Taurus. Growing up, he attended Walled Lake Northern High School where played for the school team. Hellebuyck graduated from the University of Massachusetts Lowell. Connor Hellebuyck played one year of junior hockey for Odessa Jackalopes after her high school career. Likewise, he also played two-season for UMass Lowell River Hawks in the NCAA Men's Division I Hockey East Conference. He played 54 games and made 38–12–2 record. Hellebuyck won the inaugural Mike Richter Award as the top goaltender in college hockey during the 2013–14 season. On 5th April 2014, Hellebuyck signed a three-year, entry-level contract with the Winnipeg Jets and played his first professional season in the 2014–15 season. Furthermore, Hellebuyck was also selected for the 2015 AHL All-Star Game serving as the Eastern Conference starter. He won his first NHL game on 27th November 2015, against Minnesota Wild. Hellebuyck signed a six-year contract extension with Jets on 12th July 2018.